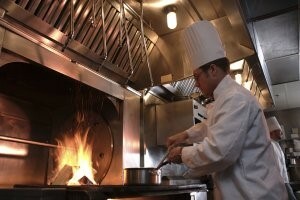 Restaurant fire suppression systems are designed to work in the unique set of circumstances posed by commercial kitchens. We have several products for kitchen fire suppression and will recommend the appropriate pre-engineered wet chemical suppression system for the hazards of your commercial kitchen. The system is designed to protect areas associated with ventilating equipment, including hoods, ducts, plenums and filters. It also protects auxiliary grease extraction equipment and cooking equipment such are various types of fryers, griddles, range tops, broilers, char-broilers, and woks. If you are not familiar with UL 300, please give us a call. One of our experienced pre-engineered suppression system technicians will be happy to help. Required service by the code book is every 6 months. Maintenance of your pre-engineered fire suppression system is very important. There are critical components that are needed to be in good operating order when they are called upon. Our commercial kitchen customers rely on us to inspect their equipment and maintain it. We can design a maintenance program that meets your specific needs and those identified by NFPA. Contact us for additional information.